What's In A Design? A Smartphone Battle In The Highest Court The Supreme Court hears oral arguments on Tuesday in a case that pits Samsung against Apple — and could have major repercussions for tech products across the board. Samsung and Apple, two smartphone giants, have been battling each other — not just in the marketplace, but in the courts — since 2011. Apple alleged, in part, that its South Korean rival had infringed three design patents for discrete components of the iPhone — the front face of the device, the rounded edges framing the face, and the device's distinctive matrix of colorful square icons. In 2012, a jury ruled in Apple's favor and Samsung was ordered to pay $399 million in damages — all the profits it had made on 11 infringing phone models. Samsung appealed, arguing that it should not have to fork over its total profits; rather, it should only be liable for the specific design elements it infringed. 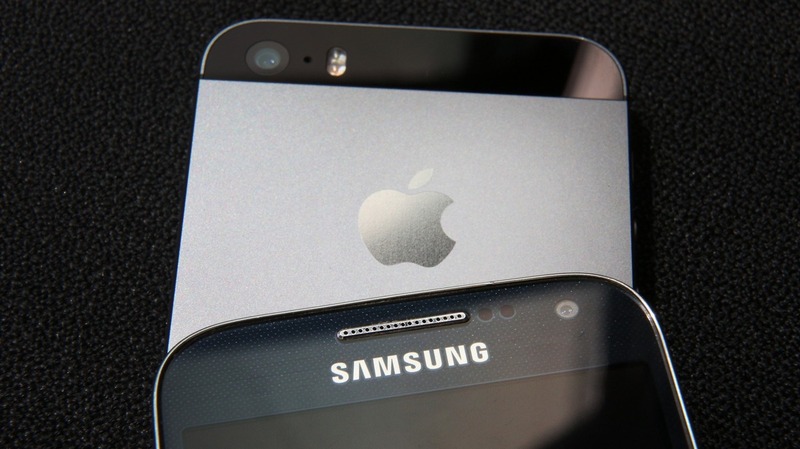 The Court of Appeals for the Federal Circuit, which specializes in patent law, rejected that argument, agreeing with Apple that Samsung had to cough up all of its profits on an infringed "article of manufacture." "The game then becomes, what's the article of manufacture?" says Daryl Joseffer, who formerly served as principal deputy U.S. solicitor general. "Is it the cover of the phone which is the design? Or is it the entire phone?" Apple contends it's the entire phone and claims that Samsung infringed patents that cover the "iconic look and feel" of the iPhone. When the iPhone first entered the market in 2007, its "innovative" design distinguished it from competitors, Apple says. The iPhone maker also argues that a smartphone's design and its underlying technology form a single, unitary product. Samsung counters that design features account for a small portion of a smartphone's value. The more important factors, Samsung says, are "functional, non-design features," such as larger screens, GPS navigation and app availability. The company points to market research, conducted by its rival, that shows that no more than five percent of consumers gave "design in general" as the reason they purchased a particular smartphone. It adds that more than 200,000 patents make up a single smartphone. "It's hard to come up with an argument that passes the straight-face test that says the only value of the iPhone is that it's a rectangle with rounded corners," says Mark Lemley, author of a brief supporting Samsung filed by 50 intellectual property professors. Apple points out, however, that Samsung's share of the smartphone market quadrupled from five to 20 percent during the two years following the release of its first infringing phone. The game then becomes, what's the article of manufacture? Is it the cover of the phone which is the design? Or is it the entire phone? Samsung's lawyers declined to discuss the case on the record. But the company warns that a victory for Apple will unleash a torrent of litigation, as design patent holders seek outsized awards for infringement of elementary design components. Leading tech companies, including Google, Dell and Facebook, echo that concern. In a brief supporting Samsung, they claim a win for Apple would have "a devastating impact" on investment in complex technological products. Apple counters that extra design protections encourage investment in innovation. The company's chief litigation officer, Noreen Krall, notes that, unlike Samsung, Apple spent billions of dollars on developing its smartphone at a time when the project was viewed with great skepticism. "What we're fighting for, here, is innovation and restoring the integrity of the design process," Krall says. Apple's supporters, including retail designers like Tiffany & Company and Adidas, argue that strong design protections deter design piracy at a time when technology makes it easier to produce knockoff goods. In a separate brief, more than 100 industrial design experts add that consumers are often misled by complex technological products that look the same but are not. The case has a variety of complications, including challenges to the original jury instructions and other legal tangles. Indeed, the Federal Circuit, in siding with Apple, said it was doing so because of the express command of the patent statute, even if that "makes no sense in the modern world." Given all these twists and turns, the Supreme Court, which hasn't heard a design patent case in more than 120 years, could dodge the dicey design dilemma and send the case back to the lower courts for further consideration. Or it could tackle the design question head-on. A decision is expected later in the term.